Thus, this wrap was born. While not the blistered perfection of a freshly baked naan flatbread, a quality pita makes a tasty base. For the spice blend, I put together curry powder, cumin, and cayenne, but feel free to vary based on your preferences or pantry. Try turmeric, coriander, garam masala… you really can’t go wrong. I gave the chickpeas a quick saute with the spices, onion, and a little diced tomato. 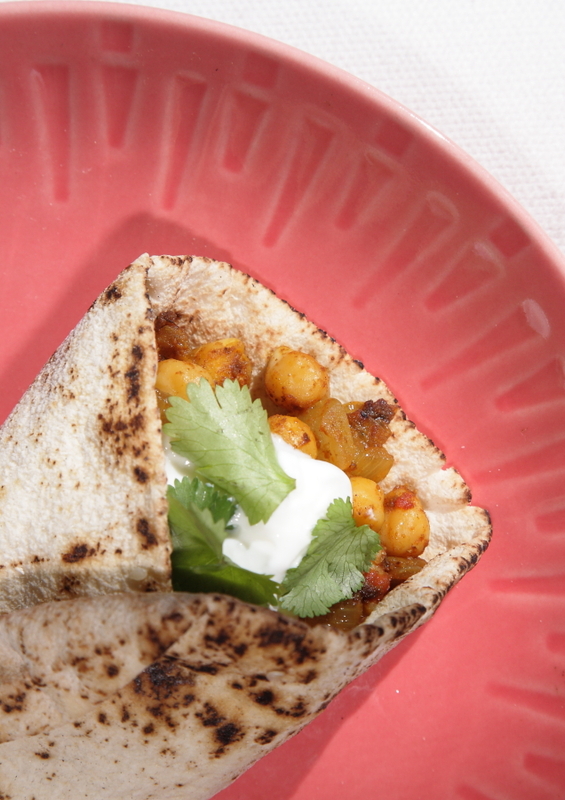 The result is a drier dish than a traditional curry, which works well with the wrap format. Like any Indian-spiced beans, I topped with plain yogurt and fresh cilantro. I can’t help myself, the combination is too perfect. I ate this for lunch with a side of fruit, but it could work as a light dinner also. I saved the leftover chickpeas that wouldn’t fit into my wrap, and sprinkled them over a salad the next day. It was totally a good idea. After getting to enjoy these unexpectedly good impromptu chickpeas, I’m not even disappointed that I had to postpone my hummus. 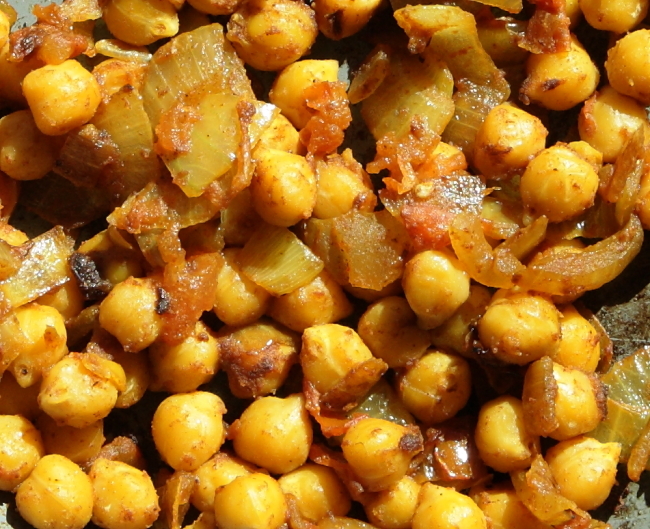 *Any recommendations for the best chana masala recipe I can make at home? I’d love to expand my repertoire. Heat the olive oil in a large skillet over medium-high heat. Add the onion and cook for several minutes, stirring frequently, until it begins to brown. Add the spices and salt, and allow to cook while stirring about 30 seconds, until fragrant. Add the chickpeas and tomatoes, and cook for about five more minutes. The tomato will soften and the chickpeas will begin to crisp. 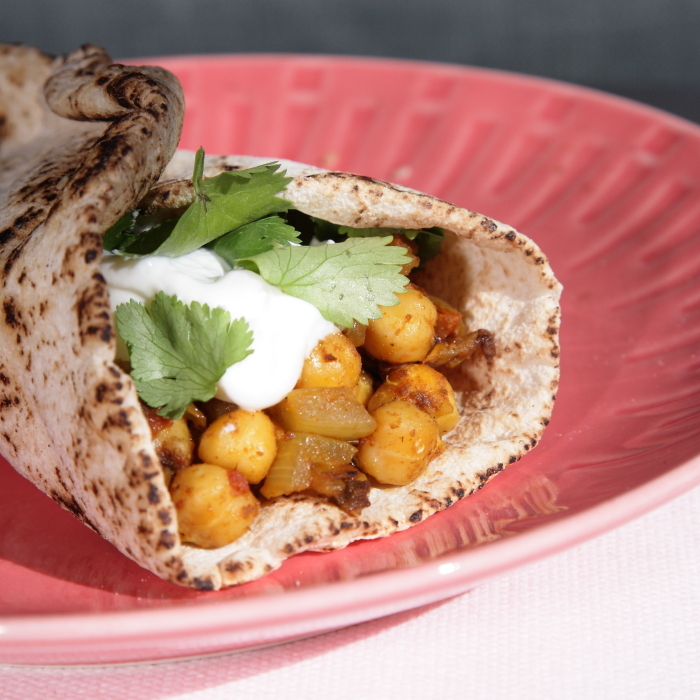 Serve the curried chickpeas on a warm pita bread, topping with yogurt and cilantro.